When Roxas first became part of the “Organization,” he spent many days on missions collecting hearts and befriending another member named Axel. 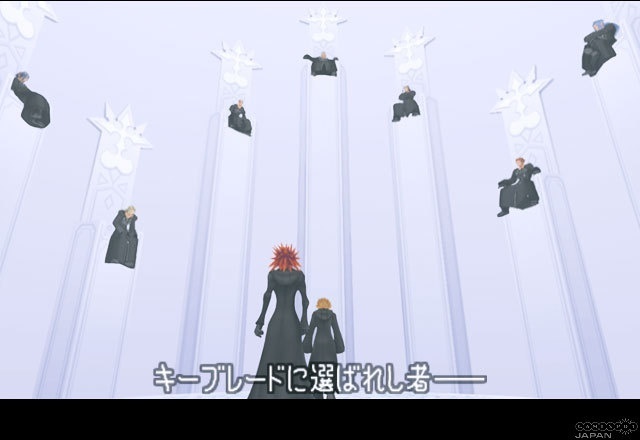 However, when Axel was sent to “Castle Oblivion” on a special mission, Roxas teamed up with the Organization’s new, fourteenth member: a girl named Xion. Slowly, the two warmed to each other. Once Axel returned from his mission, he, Roxas, and Xion developed a routine of ending each busy day by having ice cream atop the Twilight Town clock tower. There, they talked about work, friendship, their memories, and the meaning of a heart. One day, Xion was ordered to dispatch an imposter–Riku, who had donned the Organization’s robes to protect Sora. But Xion was overpowered and told her Keyblade was a “sham”. After failing a second mission, she slipped into a coma. When Xion finally awoke, Roxas’s daily routine resumed a kind of normalcy – but something in his friend had changed. Slowly, Xion began to question her own existence. On Day 255, Xion visited Castle Oblivion and discovered “what” she was. Roxas waited for Xion at the clock tower, but she never came. The next day, he learned she had deserted the Organization. Roxas tracked her down and tried to convince her to return, but Xion drew her Keyblade threateningly. It was only once Axel appeared that he and Roxas were able to bring her back by force. After learning some of the truth about Xion, Roxas found his own existence thrown into question. He lost faith in Axel and the Organization, who had kept so much hidden from him, and decided to run away. Meanwhile, Xion had tracked down a girl named Naminé, and decided to return her share of Sora’s memories to their owner. Axel hunted her down and made a double-edged promise: “Keep running – I’ll always be there to bring you back.” After barely managing to keep that promise, Axel collapsed, and Xemnas, the Organization’s leader, took Xion away. Aimlessly, Roxas found himself wandering toward the clock tower. There, Xion revealed herself to not be a “her” at all, but a faceless puppet that the Organization had created as a cage for Sora’s memories. The last of those memories were inside Roxas–Sora’s Nobody – and she would have to take them from him to become a complete Sora replica. The two fought, and Xion got her wish: she was defeated. As the memories that made her up returned to Sora, she ceased to exist, and vanished from the minds of all who knew her. Confused and angry, Roxas decided to challenge Xemnas and the Organization, free the hearts they had collected, and destroy “Kingdom Hearts.” But Roxas was not strong enough to win, and if he fell here, Sora would never awaken, so Riku confronted it. In his mind, Riku heard the last wish of a girl whose name he could no longer remember: to stop Roxas. He nearly failed, and had to allow the darkness in his heart to take over before he was able to subdue Roxas. A boy named “Roxas” woke up in his room in Twilight Town after having a strange dream.